Select the “Do not show this again” box, then click Run. Tip: A desktop shortcut is created during install. Each time you’ll launch EZAnalyzer in the future it will be auto-updated if necessary! (currently Internet Explorer 11 seems to work best for JNLP). 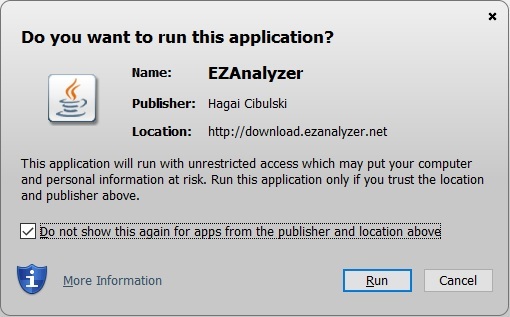 Look for a notification like “EZAnalyzer is an app loaded from the internet”, approve opening it anyway and confirm. Right click the jnlp file.